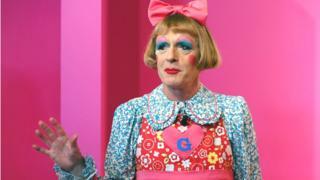 Artist Grayson Perry will bring his first major solo exhibition to Scotland as part of the Edinburgh Art Festival. The former Turner Prize winner's exhibition Julie Cope's Grand Tour will be at the city's Dovecot Studios. Artists from around the globe feature in the programme for the 16th edition of the festival, just announced by organisers. As well as a wide range of contemporary art there will be major retrospectives, such as the Bridget Riley exhibition at the Royal Scottish Academy, spanning more than 70 years of the painter's work. Sorcha Carey, festival director, said: "Bringing together national institutions alongside leading contemporary art spaces, commercial art galleries and artist-run initiatives, our festival is born out of the rich reservoir of knowledge, expertise and passion for the visual arts that characterises our city all year round. "As ever, the breadth and range of the programme opens up space for surprising connections across time, art form and the city of Edinburgh itself." Sculptor and former fashion designer Nicole Farhi's work Writing Heads, a series of 25 busts of 20th Century novelists and playwrights, will be on display. Amanda Catto, head of visual arts at Creative Scotland, said: "The Edinburgh Art Festival is a highlight of the visual arts calendar in Scotland and an exceptional opportunity for people to experience a rich mix of exhibitions and events across the city." The festival runs from 25 July to 25 August .